Whenever I make oatmeal on the stove, I end up with a boil-over or a scorched pot. Not so when I use my electric pressure cooker! Steel cut oats cook perfectly in the pressure cooker, without any kitchen disasters. And without a terrible mess! In the fall and winter, I make this hearty version with steel cut oats, apples, and cinnamon. It’s the ideal breakfast to warm you from head to toe on chilly mornings. Steel cut oats normally cook for upwards of a half hour on the stove, with constant stirring required. 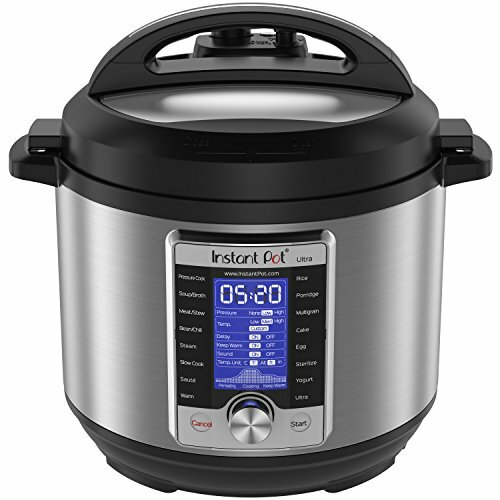 It takes about the same amount of time in the pressure cooker (I love my Instant Pot! ), except you get to walk away while the oats cook themselves. I just love that! Since the pressure cooker breaks down ingredients so efficiently, you want to use apples that can hold up to all of that cooking power. Granny Smiths are my apple of choice, but any firm baking apple or even firm pears or quinces should do the trick. Whenever I make steel cut oats, I take the extra step of toasting the oats in a little bit of butter or coconut oil using the pressure cooker’s sauté setting. This adds a bit of toasty flavor and makes the house smell amazing, too. This recipe makes quite a bit and you may have leftovers. The easiest way to reheat an individual serving of oatmeal is in the microwave. Heat in a microwave-safe bowl for 2 to 3 minutes, until piping hot. The oatmeal will have thickened—stir in a splash of milk to thin it out again. Serve up your oatmeal with butter (or coconut butter for a dairy-free option), a little brown sugar or maple syrup, and some chopped nuts for a little crunch. Many pressure cooker manuals instruct you not to cook the oats, since they can foam up and clog the pressure release mechanisms, but Instant Pot says you can cook the oats as long as the pot is no more than halfway full. If you're using a stovetop pressure cooker, you may have more issues with scorching, as well as clogging the pressure release, since they cook at higher pressure. Cook time for a stovetop cooker would be for ten minutes shorter and allow the pressure to release naturally and completely before opening, to avoid any risk of a bubbly mess. 1 Toast the oats: Select the Sauté setting on your electric pressure cooker and melt the butter. Add the oats and cook, stirring often, for about 5 minutes, until the oats are aromatic and lightly toasted. 2 Pressure cook the oats: Stir the water, apple, brown sugar or maple syrup, cinnamon, and salt into the oats, making sure all of the oats are submerged in the liquid. 3 Release the pressure naturally for 10 minutes: When the cooking program ends, let the pressure release naturally for at least 10 minutes, then move the Pressure Release to Venting to release any remaining steam. Open the pot and stir the oatmeal to incorporate any extra liquid. 4 Serve the oats: Ladle the oatmeal into bowls and top with butter, brown sugar or maple syrup, and chopped nuts. If the oatmeal thickens up after sitting, thin it out with a splash of milk. Hello! All photos and content are copyright protected. Please do not use our photos without prior written permission. If you wish to republish this recipe, please rewrite the recipe in your own unique words and link back to Pressure Cooker Apple Cinnamon Oatmeal on Simply Recipes. Thank you! Delicious! I use brown sugar and add a tad bit more than called for. Absolutely perfect and delicious! Thank you! Very nice on a cold WI morning! I love the hands off approach you get with the pressure cooker. Coco is right, it isn’t faster but it gave me time to drink my coffee and read my newspaper. Very good oatmeal and one I’ll make again for sure. Loved it! So easy to make and so tasty. Q: can you use other type of oats such as rolled instead of steel cut? So glad you enjoyed it, Darya! Yes, you can use rolled oats in this recipe instead of steel-cut. I’d do 2 cups of rolled oats and 5 cups of water, cook for 3 minutes at high pressure, and allow for a full natural pressure release after cooking.